Loboc River Resort Bohol, Philippines | Complete Your Bohol Experience! Fishing, Stand-up Paddle Boarding, and Firefly Watching Boat Tours are a few of the activities one can look forward to when staying at Loboc River Resort in Bohol, Philippines. Our native-designed huts with modern amenities offers captivating river or forest views. The restaurant we have on site provides a wonderful view of the Loboc river. Our affordable riverside accommodation is a perfect choice for couples, families, backpackers, and adventure travelers. Enjoy sumptuous meals and refreshing drinks at Venia’s Kitchen. Our charming restaurant is open-air and overlooking the river. The accommodations here at Loboc River Resort showcase the best views of the river and the forest. Our rooms and suites are supported by sturdy stilts and connected by quaint wooden bridges. During the summer high tide season, enjoy a unique resort experience as water from the river permeates the hotel grounds, bringing in small fishes as it flows. Loboc River Resort is central to the popular “Countryside Tour” of Bohol. After enjoying Loboc’s river cruises, floating restaurant, children’s choir, and other attractions, you can proceed to other places that makes Bohol a tourist paradise. The Tarsier Conservation Area, Chocolate Hills, Tagbilaran City are less than an hour’s drive away, as well as the lovely beaches of Panglao Island. 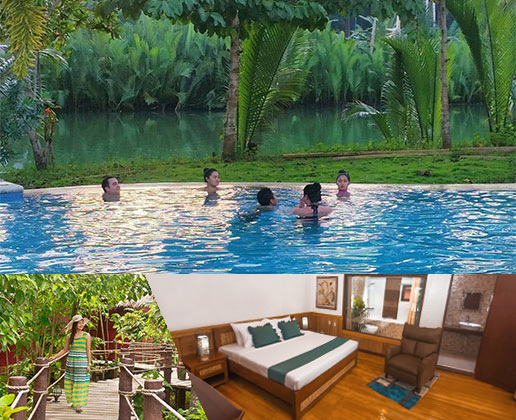 Loboc River Resort provides more than your usual accommodations. We present to you a memorable Bohol experience courtesy of our breathtaking natural surroundings and signature warm hospitality. If you want a unique nature resort experience that is different from Bohol’s beaches, this is the perfect place for you.